This driver makes me really nervous. We all think he’s a maniac. Very aggressive in intersections, which are chaotic to begin with. 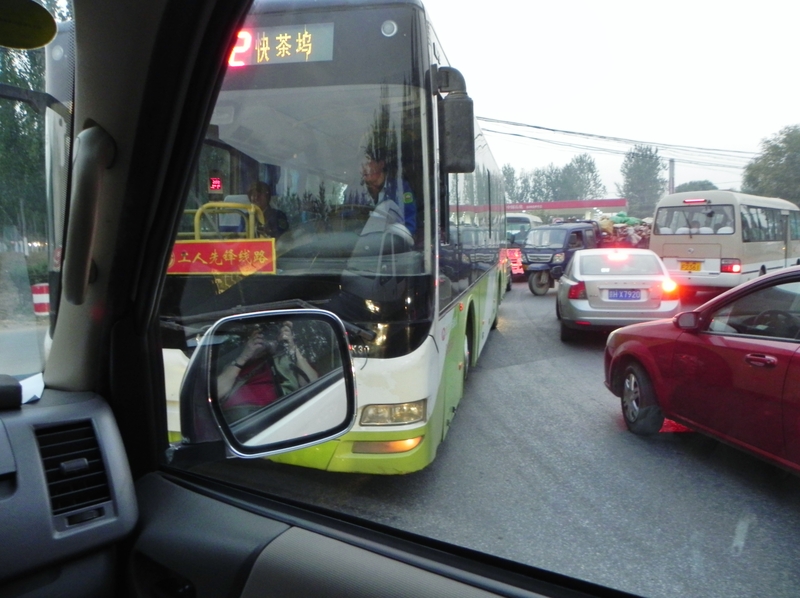 This is a picture at one of the Beijing intersections. I had claimed the front seat of the van as I tend to get car-sick. Sometimes being in front is not an advantage, as I could actually see what was going on – pretty scary at times! He’s always taking cell phone calls – even has two phones, and one time I caught him texting while driving down the freeway. And sometimes I swear he falls asleep. He drifts from one lane to another and other cars/trucks are always honking at us. Not only that, but he’s very erratic in speed – sometimes going 100 km/hr, and then for no reason slowing down to 40. Pam was having apoplectic fits! We spoke to our guide Leo, but he just got defensive, saying the driver had been driving for 25 years and never gotten in an accident. He did tell him not to text. Later, it came out that he hadn’t worked with this particular driver for that long. Swell! Anyway, after about an hour’s drive, the van just sort of pulled off the side of the road and we were told this was where we were getting out. Seemed kind of an isolated place to be seeing the Ming Tomb’s Sacred Way. But it turned out to be a good place – I think we cut off a lot of walking from the bus parking lot. The Sacred Way (1540 AD) was kind of magical in its own way. 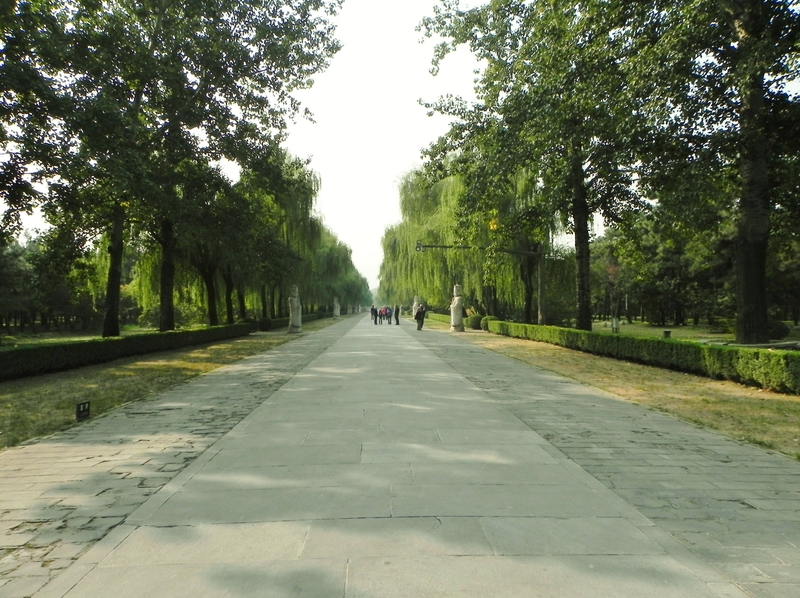 Just a wide boulevard lined with trees and huge stone statues – court attendants, camels, elephants, dragons, and other creatures – but a serene place. 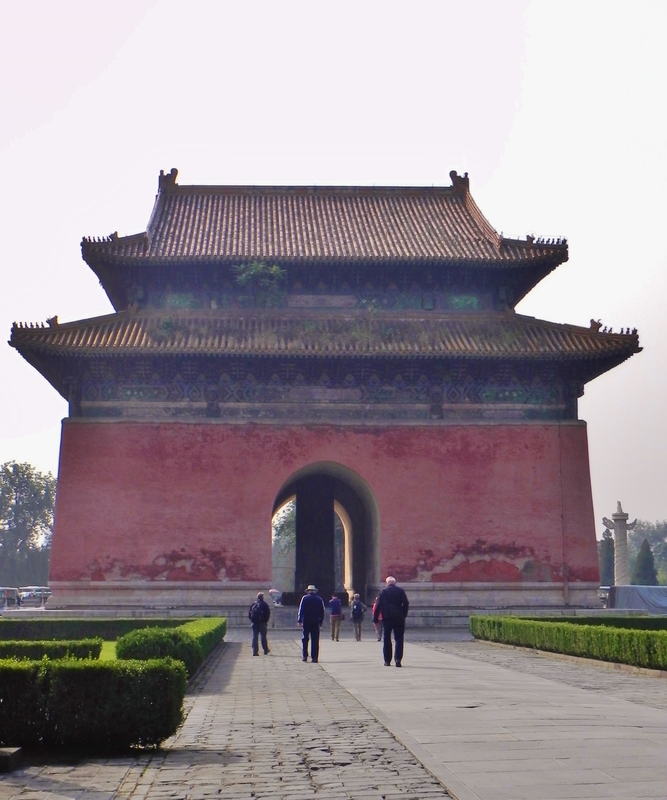 I tried to imagine the procession of courtiers in all their finery parading down here to bury and honor the Emperor. Imagine that it took days of pomp and ceremony for everyone to pass. At the end was a large ancient Chinese Gate that was quite impressive in its scale. From here our van picked us up. Would have loved to see the actual Ming Tombs, but “no time”!! Surrounding this area were lots of apple orchards and other fruit trees. Don’t know how they grow with all this air pollution. The soil does seem rich and black, but the air is positively brown. Not far away, we were taken to the Jade Factory. The “tour” of the “factory” was brief in the extreme – only a few workers doing the carving at big machines that were like mounted Dremel tools. The workers were turning the jade against the spinning tool as opposed to holding the tool. There were also a couple of people doing polishing. A short explanation of how to tell real jade from fake – real jade is translucent when held up to the light vs plastic. And plastic scratches badly when rubbed against something – jade does not. I tried this later in street markets and I had difficulty determining that the plastic jade sold there was really plastic, so don’t know how accurate these jade “tests” really are. After the “tour” we were given 45 minutes to shop. We told Leo that we wanted to leave in 20 minutes and he agreed, so this forced shopping stop wasn’t too bad. They did have some lovely larger pieces that were delicately carved, but they were way too expensive and I don’t know how you’d get them home. A lot of the jade we saw wasn’t light or dark green, but white, and even brown or black. Some of the best ones were multicolored and the carver had used the different colors to enhance the design he had chosen. At least the bathrooms were clean and had a few “western style” toilets. And even had paper to dry your hands, with a sign that said, “one only please”. Now on to lunch near the Great Wall. About another hour’s van ride on a narrow winding road with lots of blind curves and our terrible bus driver – I tried not to look. The scenery going up the mountains was very pretty, even through the smog. The lunch place turned out to be “The Schoolhouse” which I had read about on TripAdvisor. We ate on the patio and it was great! Western Food – yippee! DH had a hamburger with French Fries and I had a huge Club sandwich. There didn’t seem to be an issue at all with this place including beer with our food for free. Some inconsistency with this policy it appears. There was a glass blowing workshop behind the patio that we took a quick run through. Some OK pieces, but again, how would you ever get these home in one piece? 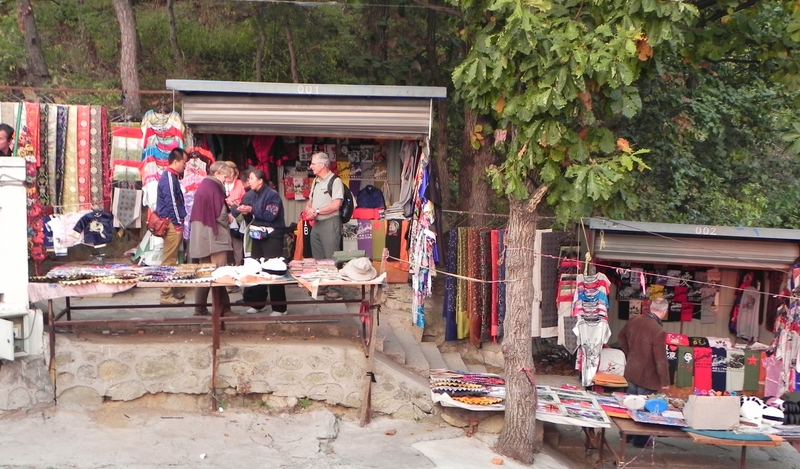 We walked from the parking lot through the usual gauntlet of street vendors selling souvenirs, although this path was longer than usual and it was all fairly steeply uphill on uneven cobblestones. The vendors were all more aggressive than usual – offering t-shirts for only $1, but when you looked at one, the price suddenly changed – the $1 was for a baby sized t-shirt or one that was already worn – ugh! We were already tired when we got to the end of the gauntlet. 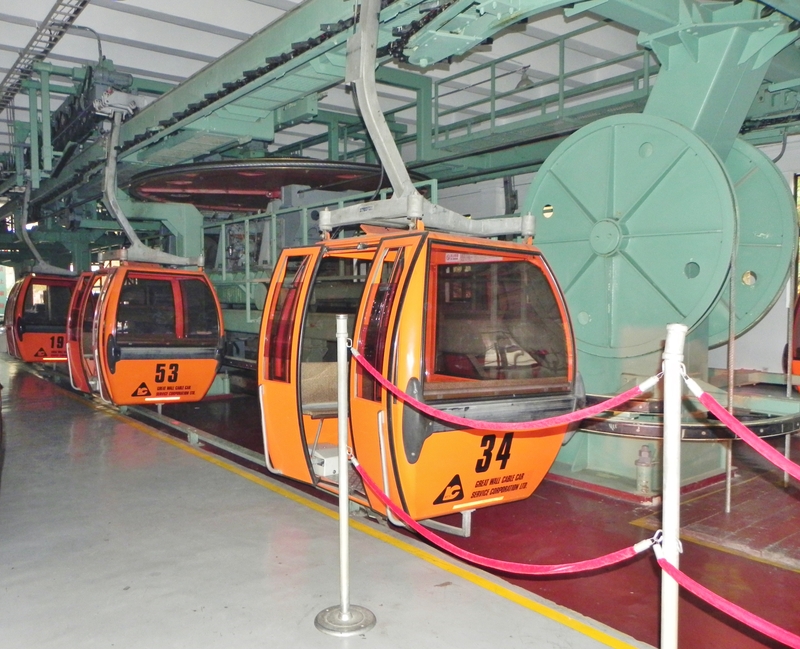 Then we took an elevator up about 6 floors to get onto the gondola. DH and I ended up with our own cab accompanied by Leo. A little daunting getting on the first time as the cab is moving the whole time, albeit slowly. After we got off the gondola, Leo gave us an hour and a half, which turned out to be enough time. It was already 3:00 and the light was beginning to fade. Then he pointed us to some exceptionally steep steps to get up to the Great Wall itself. One step to the next was about knee high. I thought to myself that if it was all going to be like this I was doomed not to see very much of the Great Wall despite all my tread milling. However, it didn’t turn out to be so. There were certainly lots of steps and uneven walking, but we both managed to see quite a bit of the Wall. DH quit a bit before me, but he’s doing much better with his hip than the last several days. His walking stick definitely helps. Some parts are fairly steep, like these stairs. The Wall, of course, is amazing. To think that they built this with only human labor on the crest of these high mountains is staggering. The views would have been better if it hadn’t been so smoggy, but I still took lots of pictures. The light almost got better as it faded – it cast a nice warm glow on the stones of the Wall. The other 4 of course made it all the way to the top, even up the really steep part. I swear they even said they wanted to run to the top. But I think even they were too tired by the time they finished. On the way back down, a lot of the little vendor stalls had already shut down, but we managed to buy an ObaMao t-shirt for a friend back home who will enjoy the joke. Think he’ll get a kick out of it. Back on the van for an excruciating ride back into town. We were going along all right (except for the crazy driver) when we came to a dead stop at a toll booth. After the toll we went nowhere as 12 lanes merged down to 4 and then 3. It was a game of chicken – even with some huge 18-wheelers. Pam was going nuts in the backseat! It was so late (8:00) by the time we got into town, that we (easily) talked Leo into stopping for dinner on the way back to the hotel. His original plan had been to go to the hotel first, then drive another 45 minutes further to a “great” Chinese restaurant. So instead we went to TGI Fridays, of all places. Can’t remember what I had, but it didn’t taste the same as back home. Had another discussion about what drinks were included –“ None!” according to Leo. This was beginning to bug me and Pam happened to have the China Spree book with her. I pointed out to Leo the part of the documentation that said that 2 !! drinks were included per person per meal, including beer. He then backtracked and said that only if it were local beer – that previously DH and Phil had ordered Tsingtao Beer and this was not included because it was a “national” beer. Decided not to press him on charging us for bottled water – started to say something sarcastic about “national” water brands, but let it drop. After dinner we found out it was only a 5 minutes walk to the hotel. No van ride! Halleluiah! All went to bed right after dinner as we have a very busy day tomorrow. Don’t think Sandra and Pam went to the hotel pool tonight.